Former CIA Director James Woolsey gave a talk at Princeton University last week. I decided not to attend, fearing that I might be unable to restrain myself from causing an ugly scene. But I am extremely pleased and proud to forward to you a letter written to the campus newspaper the next morning by a young Princeton sophmore (a girl, presumabnly 18 or 19 years old) protesting Mr. Woolsey’s speech in very strong and eloquent language. I have written to her expressing my admiration and appreciation (enorris@princeton.edu). Perhaps others will be moved to do likewise. Energy, security and the crusades? On April 23, as most of the campus was basking in the sun, former CIA director James Woolsey spoke at a lecture titled “Energy, Security and the Long War of the 21st Century.” Within the first five minutes of the lecture, my casual summer mood turned into shock and disbelief. Woolsey’s lecture began and ended as a racist and misinformed diatribe against Muslims, which overshadowed his more reasonable insights into alternative energy development. Woolsey’s expertise on the current global energy situation enlightened some at the lecture. But the strength of his argument about alternative energy was subsumed as his severe misperceptions about the Middle East surfaced. His racism undermined his credibility. I found myself apprehensive that the authority I perceived him to have on environmental issues would lead others to believe he had equal credibility in the issues of Middle Eastern politics. While Woolsey did make a few valid criticisms of Middle Eastern regimes, for the most part, his offensive discussion overrode them. More importantly, and most shocking was his simplified, misinformed view of the realities in the Middle East today. The basic premise of his speech posited that Muslim regimes and terrorist networks are a monolithic, “genocidal” and “maleficent” entity with whom we should not negotiate. Essentially, he said that the Muslim and Western worlds could not coexist without destroying each other. His policy prescriptions turned a blind eye to the distinctions between peoples, regimes and politics in favor of an oversimplified, emotion-infused polemic against those “others” of the not-too distant East. His first mistake was to characterize Muslims as a homogenous mass with genocidal tendencies. Woolsey kept repeating that Muslims want to bring about the end of the world because “Allah will know his people” and that killing others is inconsequential. Besides this unashamed bigotry, Woolsey’s conclusions had other fundamental flaws. Contrary to Woolsey’s characterization, Islamic theology unequivocally condemns genocide, no matter who the victims are. As for Middle Eastern governments, their primary concern is keeping their regimes intact. Exemplary of this was Iran’s response to Sept. 11, 2001, when it laid aside years of animosity to reach out to the United States for dialogue and cooperation in fighting the Taliban. If the Iranian government was truly motivated by some crazy anti-Western genocidal ideology as Woolsey suggested, the Iranians would not have done this. Woolsey also made the false statement that all terrorist networks and Middle Eastern governments were working together to defeat “the West.” Testament to his misunderstanding of the region was his statement that Iran had helped al Qaeda plot to set off dirty bombs in London. To think that al Qaeda would ever work with Iran is ludicrous. A main tenet of Al-Qaeda’s ideology is the destruction of Shiite Islam, especially the Iranian regime. It is incredible that this high-profile official who had access to all the U.S. intelligence in the region, either did not know or failed to acknowledge this basic fact about al Qaeda’s ideology. His main solution to this problem was to stop negotiating with these regimes. While a decent idea, America unfortunately has a history of negotiating with less than savory regimes such as China, Uzbekistan and Russia. 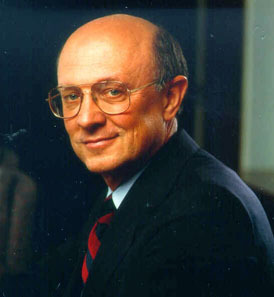 Woolsey demonstrated a double standard in his opinions on the Middle East, especially when his suggested policy of sanctioning these regimes would do little to alleviate these human rights abuses. The kicker came at the end, when Woolsey asked the audience, “What is the only nation in the Middle East where Arab Muslims have equal representation, full civil liberties and are treated as first-class citizens?” As he paused, I guessed … Jordan? Egypt? Qatar? His Answer? Israel. The current Israeli system may be a democracy to some, but it is one of apartheid according to John Dugard, former President Carter and numerous others. But he didn’t stop there, he went on to say the most inflammatory statement of the afternoon: “If the Arabs only treat the Jews with remotely the amount of respect that the Israelis give the Palestinians, then we wouldn’t have these problems.” If an Arab nation walled in its Jewish citizens, raided their homes and treated their mere existence as a crime, no country in the international community would stand for it. To say that Arabs should treat Israelis the way the Israelis treat the Palestinians is tantamount to saying they should act contrary to international law and accepted standards of human decency. I have to say that, I was proud to call myself a Princeton student when I saw people react with shock and disgust to his words (some even getting up to leave in protest) and that students challenged the racist premises of the lecture in the question and answer session. Students challenged him on America’s unbiased support for Israel and his refusal to acknowledge the differences between countries and terrorist organizations. After attending this lecture, I finally understand where our problems in the Middle East began. Woolsey demonstrated that American officials are sorely lacking in the cultural, historical and religious background necessary for the posts to which they are assigned. Imagine if our government officials didn’t create policy out of racist hatred. Perhaps then we could begin to solve the problems in the Middle East instead of agitatating them by propagating offensive stereotypes. Emily Norris is a sophomore from Brookline, Mass. She can be reached at enorris@princeton.edu.